After I put four packages of rice stick noodles into my hand cart, I heard someone say, "These noodles are for lazy people who don't want to soak their rice sticks!" Was that directed at me? Probably. 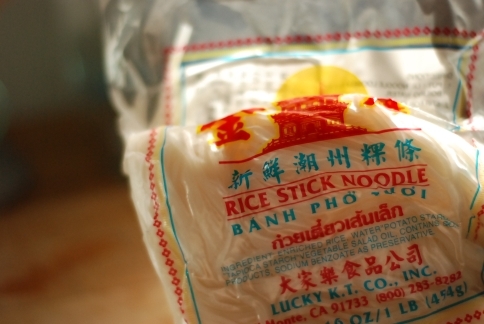 There is something wonderful and magical about noodles that cook up in 10 seconds. The texture is chewier for these fresh noodles, better than the dried ones, but I didn't feel like telling that to the person who potentially just called me lazy. Let her eat mushy noodles! Ranch 99 (or is it 99 Ranch) is a fun place to browse. I don't go often because the produce is wrapped up in Styrofoam trays and plastic wrap, the meat is of questionable origin, and the parking lot is a slow motion bumper car ride, but I am thankful that there is a Ranch 99 near me. The alternative would be to go to Little Saigon, Chinatown, Korea town, and whatever the Malaysian, Filipino, and Thai communities are called. I also don't go often because I easily can spend an hour there browsing and buying tons of stuff that I have to scramble to use up before it goes to the dumpster gods. In addition to the lazy people noodles, I also found brown rice ovalettes! I have high hopes that the brown rice ovalettes will be chewier and nuttier than their white counterparts. 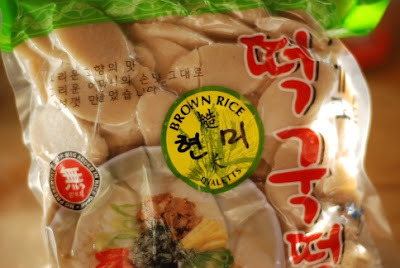 For the uninitiated, ovalettes can be put into soups, or boiled and then stir-fried just like the wide rice noodles. From the library, I checked out The Kimchi Chronicles cookbook, the companion cookbook to the television show. There's a wonderful recipe for an easy chicken stew that I've made twice now, and I plan on making the fried seafood pancakes tonight. The hardest part of the chicken stew is browning the chicken - and both times I managed to get some hot oil splattered in my eye. So, perhaps it isn't hard, but dangerous. Much to the boy's dismay, there's another batch of kimchi in the refrigerator and some more fermenting in a crock - apparently the smell makes him sick, although he loves to eat it. Since the smell only really emanates from the refrigerator once it's opened, I consider it a good way for him to diet and drink less beer. Since I can't figure where else to post it, I've been using my Twitter account to post inane food commentary. So, if you'd like to read or share inane food and occasionally knitting commentary with me and sometimes talk about cats and dogs (it's about as focused as this blog, which is to say "not focused" and full of my typical typos and grammatical errors), follow along at spindlesnspices. My husband keeps asking me to have a go at making kimchi. I really should! Michele, I regret not visiting Fubonn the last time I was in Portland. I've read such good things about it! I laugh at the people who call you lazy. ha! when my husband and i were dating, 26 years ago, his roommate, one of the original renaissance men, befriended the korean grad students in his department and had a giant kimchi making party. there were kimchi crocks buried in their rental house yard for many years. fortunately, the landlord was also eclectic. best way to get the department computer lab to myself? open my plasticware of homemade kimchi. bwah-haha. i DO like kimchi, but it is also an effective office weapon. skubitwo, that's so funny! I love the idea of unearthing vintage kimchi years later from the backyard. Perhaps instead of pepper spray, crazy xmas shoppers should carry opened jars of kimchi around to ward off others. I just always wonder, since we are now elsewhere, did he and his roommate get all of those jars of kimchi, or is some unsuspecting wonder-bread family going to find them in the carrots?? ?